West Africa’s mining development pipeline: Number of mining/explorations projects at different stages of development. Source: Mining Intelligence. Moving down the pipeline from operating mines to exploration projects, the number of gold assets increases, with 61 assets (33% of all assets, regardless of commodity) in the production or construction stages, 24 assets, or 45% of all projects undergoing economic assessment studies, and a whopping 367 assets in the exploration phase. 74% of all exploration projects are focused on gold. This focus on gold in the exploration stage indicates that the importance of gold in West Africa’s mining sector will only increase in the future, as new projects will enter the production phase. Experts are confident that significant local gold resources were underexplored, and this can spark even more interest from the international mining community. 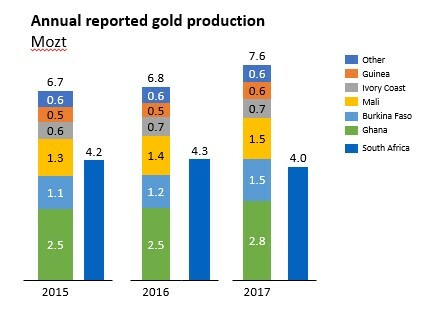 Recent gold production numbers show that South Africa was still the biggest gold producer in the region in 2017, but West Africa’s gold mining industry, led by Ghana, Mali and Burkina Faso, already produces nearly twice as much gold as South Africa, and Ghana alone has chances to overtake its struggling southern peers in gold output in the foreseeable future. Gold production, South Africa vs. West Africa, Mozt. Source: Mining Intelligence, based on companies’ reports; artisanal miners and non-reporting companies are excluded. Another important indicator of West Africa’s gold mining sector enticement for investors is production costs measured by the World Gold Council’s all-in sustaining costs (AISC) metrics. AISC shows that in Q2 2018, two West Africa mines were in the global list of top 6 lowest cost gold operations. B2Gold’s new open-pit high-grade Fekola mine in Mali was the second lowest cost mine by AISC ($445/ozt), and Perseus Mining’s new SGP mine in Ivory Coast was sixth ($520/ozt). With South Africa’s gold mining sector struggling with increased production costs at underground mines, socio-political turmoil and regulatory headwinds, West Africa is quickly becoming the continent’s main gold mining hub. Get access to the wealth of data about mineral resources in West Africa and globally, and click here for Mining Intelligence’s 2018 Western Africa Mining Map that shows the locations of more than 180 producing mines and development “shovel in the ground” projects, 20 metallurgical facilities, major roads, railroads, ports and shipping distances and regional geology. For other Mining Intelligence maps, click here.